Sadly, they don't come in extra large/wide sizes, but I'm working on finding more options for you YETI LADIES. *Look ma! I finally figured out what a wedge is. i kind of like these. hey now! ladies above 5'10" know all too well that we are sasquatch-adjacent. no need to twist the knife. I'm tall but have tiny, thin feet. Living the dream, ladies. These shoes are cute (I generally like Madewell's shoes). So not fair! Now tell us something that is wrong with you to make up for it. That's actually true - although I've always attributed it to my inner ear problems* not my dainty feet. *I wear hearing aids, Susan. I want numbers. How tall are you, and what size are your feet. SPILL, DAMMIT. @17 beats how big are YOUR feet? where do you shop for shoes??? 5'9" (so not exactly Manute Bol) with size 7.5 feet. Not that extreme, just smaller than most of my friends (even the average height ones). Eh, mostly I was trying to be funny - thanks for taking the wind out of my sales, 17beats. WOW, you do have tiny feet ! You're like Judy Jetson or something !!!! I actually have relatively small, narrow feet for my height, too ! though not as small as yours. I'm somewhere around 6 / 6-1, and my feet are anywhere from 9 to 9.5 depending on width. I'm a shop-a-phobe, so I buy all of my shoes either direct or from sites like Zappos. I'm 5'10" with size 11 feet and my Mum used the line that if my feet were smaller I would fall over all the time. Thanks Mum. Anyway, I live in moccasins, clarks, converse, brogues and ballet pumps and have a few pairs of heels that I love. More places go up to my size now but they are still usually too narrow and sales assistants still look at you like you're a yeti when you say that the giant size is still too small. I second Zappos. Also, DSW. Not because they have the best shoes, but because their website allows you to easily sort by size/width. It’s just easier that way. With long/wide feet – as with most things – it’s about figuring out what styles do and don’t work for you. For example, I never ever wear t-strap thong sandles like these because my toes hang off the sides. I'd wear something more like this. Or, when shopping for flats, I focus on the ones that show a little toe cleavage. It's not pretty but less restriction on the toes equals more comfort! Also leather shoes stretch out more than synthetics which is a *major* plus. And of course heels need to be c-h-u-n-k-y to balance out the monsters I call feet. 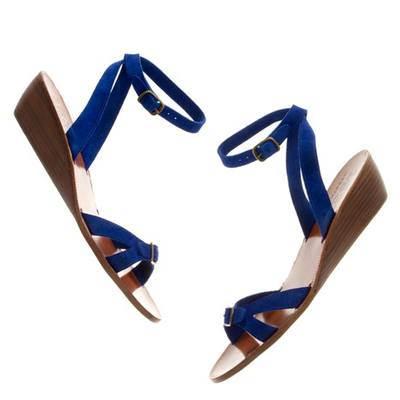 Madewell is TOTALLY rockin' it in the shoe department lately.